Showing 17 articles from September 1, 2014. Avis Miller is 100 years young and she caught a nice-sized trout Monday! 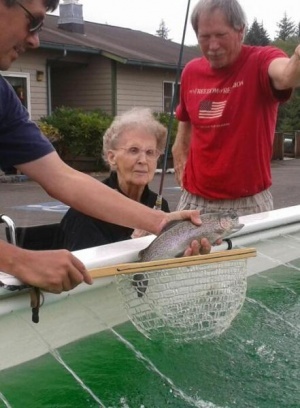 Alder House Assisted Living celebrated Labor Derby with a fishing derby for the residents. Westport Shipyard built the tank. The event was sponsored by the Pacific County Anglers, which donated the fish, poles and bait. Local fish hatchery personnel Rob Allen, Merle Hash, and Dave Shores volunteered to help. The Menlo Fire Department brought in the water while keeping the fish I their natural environment. SOUTH BEND - Last Monday (August 25) at approximately 6:10 pm, the Pacific County Sheriff's Office received a request for assistance from the operator of a commercial gillnetting vessel that had experienced engine failure. SOUTH BEND - When the residents were asked to Come and Play on Labor Day that is exactly what they did. A time for the community of South Bend to relax and take the last summer weekend to spend it with friends, family, neighboring communities and travelers from distant cities. This Saturday, the Winlock Lions Club will he hosting a second-hand sale at the Community Building and vendor spaces are now available. Area residents are encouraged to bring their gently-used items, including clothing, furniture, electronics, toys, books, DVDs, or anything second-hand items feel like parting with for a reasonable price, and reserve a booth for the event. Spaces are expected to go quickly, so sign up while they are still available. The Cowlitz Indian Tribe will be "Honoring the Spirit of All Cowlitz People" at the 15th annual Pow Wow Saturday, Sept. 20, at Toledo High School. The Pow Wow is a full-day event from noon until 10 p.m., and admission is free. Master of Ceremonies Don Ryan (Cowlitz) will conduct grand entries at 1 p.m. and 7 p.m. with the assistance of Arena Director Kevin King (Seneca-Oneida). Head Man and Head Woman Dancers, Ed Wulf (Yupik-Athabascan) and Vickie Wulf (Nipissing, 1st Nation), will be your host throughout the day and into the evening. We are proud to present Grey Eagle as Honor Drum and The Allen Family Singers as Host Drum. Guests of the Toledo Community Library will notice the back area of the building has opened up to allow for greater room for shelving and meeting space, while additional upgrades such as computers donated by Toledo Tel are expected to be installed sometime this week. These improvements are taking place just weeks after the library first opened on Aug. 13 and ahead of a scheduled open house on Sept. 20, and an appearance by Washington Poet Laurite Elizabeth Austen on Sept. 13. Ten youngsters gave traditional and modern Ugandan performances during another appearance of the Ugandan Kids Choir at Toledo First Baptist Church on Wednesday. Part of a tour of North American the choir takes on a regular basis, the children are all part of Childcare Worldwide, non-profit, faith-centered organization based in Bellingham seeking to help children break the cycle of poverty. The first week of a new month means another incredible breakfast feast on Saturday from 8-10 a.m. Come on out to the end of SR 506 and enjoy some of the best food around. There was a group staying in the Park last month when the Breakfast came around and there was a record crowd. The guys handled it all very well! I'm happy to report that Cowlitz-Lewis Fire District #20 Station 2 (Ryderwood) has new members. More volunteers are needed if Ryderwood is to keep its excellent fire insurance rating. Contact Ellis at (360) 295-3320. As it remains incredibly dry, please use caution everywhere you go. Crush your butts and don't fart in the woods! Local fundraisers have recently done well. 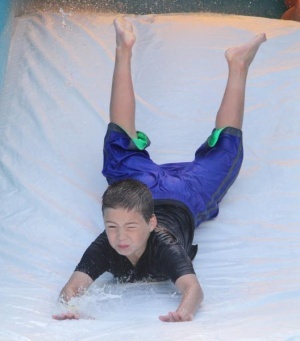 The Out Of Nothing screening in Toledo raised more than $600 for both Middle School green house project and Toledo Girls Softball Association, while the Steelhead Fishing Derby donated more than $300 each to Friends of the Cowlitz and vision:Toledo. Toledo City Council meets 6 p.m. Tuesday, due to holiday. Park Board meets 3 p.m. at City Hall second Wednesdays monthly. Visit www.toledowa.us or call (360) 864-4564. Volunteers are being sought to help with next week's National Day of Service projects, and those with weed-eating equipment are being encouraged to participate. Organizers have shared they will be focusing on eliminating knotweed growing along Olequa Creek in McMurphy Park. If enough volunteers sign up, there will also be projects to trim overgrowth from around the city streets. The event takes place Saturday, Sept. 13, from 8 a.m. to noon, with word of free breakfast beforehand at the Vader Assembly of God Church. For more information, including how to volunteer, call City Hall at (360) 295-3222. Those who have been eager to continue helping with Clean Up the Coop will have a chance to do so again starting this month, after the program took a break for the summer. The next cleanup day will be Saturday, Sept. 13, and will continue on the second Saturdays of the month. Those interested in helping are encouraged to meet at Lions Pride Park at 10 a.m. on the day of, and those with questions can call Viola Chickese at (360) 785-0178. You've got one more month to visit the Winlock Historical Museum before they close for the winter. Located in Downtown Winlock just across from City Hall, the museum is open to the public every Wednesday from 1 to 4 p.m. but will be closed starting in October. Don't miss your chance to see this tribute to our town's heritage, with many photos and artifacts from Winlock's past. For more information, or to schedule a tour by appointment, call Dave Rubert at (360) 880-6895. Joyce M. (Jacoby) Elliott passed away on Friday, Aug. 22, 2014, at 86 years of age. She was born to Fred and Martha Jacoby in Toledo. She graduated from Toledo High School in 1945. She continued her education at Washington State University with a BA in Home Economics. She taught at Elma High School, Tenino School District, North Thurston School District, Olympia School District, and Tumwater School District as a teacher in Home Economics and other subjects. A citywide overlay project is expected to begin later this month, with work to take place on multiple roadways and sidewalks throughout the city. Contractors with Longview-based Lakeside Industries met with Castle Rock Public Works Director Dave Vorse on Aug. 26 for a pre-constriction meeting, during which they determined work to replace wheelchair access ramps on affected sidewalks will begin around Sept. 15, while the overlays themselves are expected to begin around Oct. 1. The City of Winlock has announced the acquisition of property for a pump station to extend sewer lines to the Benaroya industrial park along I-5, allowing for the first major progress on the project in more than a year. Reported by Mayor Lonnie J. Dowel during the council's Aug. 25 meeting, Dowell said Winlock has finalized the process of acquiring 0.22 acres of land from Rodney and Debra Dewlly on the 400 block of SR 505 for a total of $32,572, including all fees and closing costs. Long-time Vader city official Andy Wilson has begun a project to memorialize the past mayors of Vader, going all the way back to the city's origin in 1906. Presented during the Vader City Council's regular meeting on Thursday, Wilson shared how he has been able to compile information on all 31 men and women who have served in the position and is hoping to collect photographs of each for a display in City Hall. The City of Winlock is close to selling 6.07 acres of property by Winolequa Park to Lewis County as city officials seek to ensure they are being offered appropriate terms for the sale. Discussed during the council's Aug. 25 meeting, an offer from Lewis County of $42,500 for the property has been placed on the table, as the county expects to use the land during an expansion project of Hwy. 603 intended to take place next year. After the Castle Rock Exhibit Hall Society disbanded in May of this year, many of the displays and artifacts in their possession were returned to donors and their families, while the building itself remained city property. Though the building has been kept opened during weekdays as a place to access tourist information, through the help of multiple volunteers, its future continues to be uncertain as the building is in need of structural repaints and the city remains liable for utilities, phone service and insurance payments.